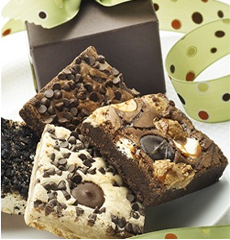 Brownies in every flavor of the brownie rainbow are beautifully gift-boxed from Brownie Points. Photo courtesy Brownie Points. Chocolate lovers will love our kosher gift list this year because it’s full of products for those with a sweet tooth. But there are also very low-calorie and calorie-free products as well. Most are less than $25.00. 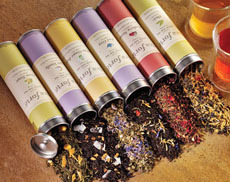 Products are shown in alphabetical order. Prices and product availability are verified at publication but are subject to change. Shipping is additional. These items are offered by a third party and THE NIBBLE has no relationship with them. You’ll earn brownie points with the kids and anyone else with a sweet tooth when you send boxes of individually wrapped brownies in twelve flavors. In addition to the anticipated chocolate with nuts, fudge, etc., there are Chocolate Caramel Crunch, Chocolate Caramel Sea Salt, Cookies & Cream and Gourmet Buckeye, a chocolate chip brownie sandwich filled with creamy peanut butter. Certified kosher by the V’aad of Columbus, Ohio. Photo by GG Merkel | THE NIBBLE. 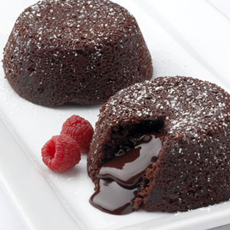 Send your favorite chocolate lover a box of rich and luscious Chocolate Lava Cakes, made with premium bittersweet chocolate and pure cocoa. Just bake or microwave for a taste of chocolate heaven. 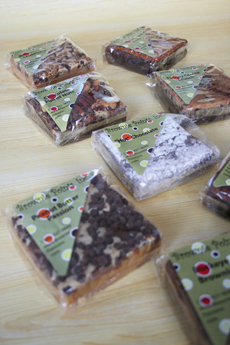 If you’d rather send cheesecake, blackout cake, lemon tarts or dozens of other favorites, Galaxy Desserts has them all. Certified kosher (dairy) by KSA. Jer (Jerry to his parents) has improved upon that already excellent combination, chocolate and peanut butter. 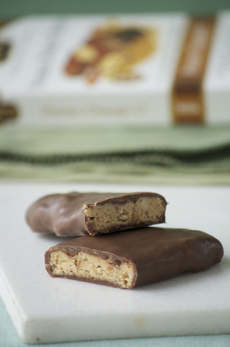 We’ve written about his bonbons before: chocolate-covered peanut butter plain, with bits of pretzel, toffee or a caramel layer. Now, the concept is available in a more casual bar form, easier to carry around than a box of bonbons. And, Jer has evolved into peanut brittle, with the same approach: Flavor it! Certified kosher (dairy) by OU. Read our full review of Jer’s Handmade Chocolates. Photo by Evan Dempsey | THE NIBBLE. 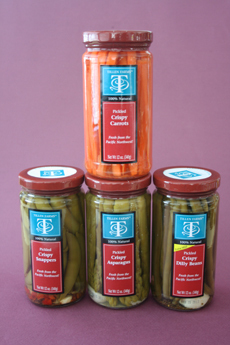 We love Tillen Farms: We treat ourselves to a couple of jars of these pickled vegetables each week. They’re very low in calories, fat free and high in flavor and crunch. Choose from Crunchy Carrots, Dilly Beans, Hot & Spicy Beans, Snappers (snap peas) and Sweet Bells (peppers). Use them in cocktails, on relish trays and in salads. The brine is delicious: We reuse it to marinate chicken and fish. Read our review of Tillen Farms. We love our veggies—especially pickled! Photo by Hannah Kaminsky | THE NIBBLE. 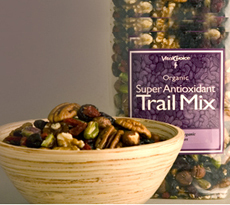 This delicious, naturally sweet and healthy snack tasted as good to us as a box of candy (and we eat plenty of that, too). Anyone making resolutions for a healthier new year will be happy to get a bag. Certified kosher by Earth K. A great nosh. © Copyright 2005- 2019 Lifestyle Direct, Inc. All rights reserved. Images are the copyright of their individual owners.